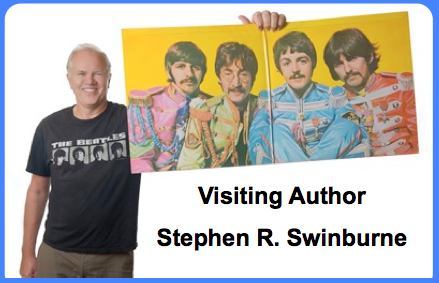 Steve holds a bachelor of arts degree in biology and English from Castleton State College, Vt. He has worked as a ranger in a number of national parks. in Africa, hiking in Scotland, monitoring sea turtles on a Georgia island, a winter trek through Yellowstone and watching shorebirds in New York have all led to book projects. Steve plays guitar and makes music as part of his presentations and writing workshops. He will be working with our students on Thursday and Friday, and will give a presentation at Community Time on Friday. And now for the skill testing question: Who is Steve’s favorite musical group?